UTM RBT training kit. The officer uses his personalized rifle, with UTM bolt carrier and magazines. A few years ago Richard and I were invited to attend a special showing of the Universal Training Munitions (UTM) while we were at SHOT Show. I’m really glad that we attended. During that UTM showing Richard and I were able to fire both UTM rifle and pistol rounds through a converted AR-15, and converted Glock 9mm. Considering those two weapons platforms are what my department issues as on-duty firearms (albeit a Glock .40 cal. ), I felt comfortable performing a solid evaluation. UPDATE: BlueSheepdog was able to acquire a UTM Civilian Training Ammunition Kit for review. In addition to our experience shooting the UTM munitions at SHOT Show a few years back, we now have a more in-depth review of similar products aimed more towards the civilian market. That review can be viewed here. Originally the UTM conversion kits and training rounds were bordering the cost prohibitive level. Kits were running around $400-500 each, and UTM rounds were going for around $1.50 each. However, with increased demand worldwide, including a large U.S. Department of Defense contract, the UTM prices have dropped dramatically. Conversion kits are going for around $300-400, and UTM rounds have dropped to around $0.58 per rifle round, and slightly less for pistol rounds. With prices that low, the UTM kits and ammunition are not only competitive with other options, they may just be lower in some situations. Add in the advantages that we’ll discuss below and the UTM option begins to look like a clear winner in Force-on-Force training. Force-on-Force training, or Reality Based Training (RBT), is absolutely the best way to gauge an officer’s mastery of critical firearms skills including: accuracy, reloads, tactics, and communication skills. It is as close to a real firefight as we can safely place our officers. If the training is regimented, with specific objectives related to skills training already provided, the process can be highly effective. Police force-on-force (RBT) training is key to successful deadly force encounters. We have all stood on the live fire line and mimicked a “threat” situation. We draw as fast as we can, fire on the target as directed, hopefully breath and scan, and then re-holster on command. Some agencies even allow their officers to perform some lateral movements, or displace to a knee, but other than that the live fire range typically is very restrictive about realistic combat movements. Force-on-Force training exposes bad habits, identifies deficiencies, and proves critical training points. Officers learn quickly that they can’t cheat or “John Wayne” themselves through a scenario with a committed and trained opponent. They either learn and execute their training, or there is a penalty. Just like on the road! The UTM training kits and munitions provide the most realistic platform for officers to experience these “threat” situations by using their own weapons. Since our time at the invitational shoot, I’ve had the opportunity to use or be around the use of UTM products on several occasions. Each time the UTM munitions out perform Simunition FX and Airsoft rounds in reliability and accuracy. Those using the UTM munitions do not want to go back. The UTM RBT NLTA’s Accuracy and Reliability cannot be matched because of its patented Dual Primer (9mm) and Primer/Power-load technology. 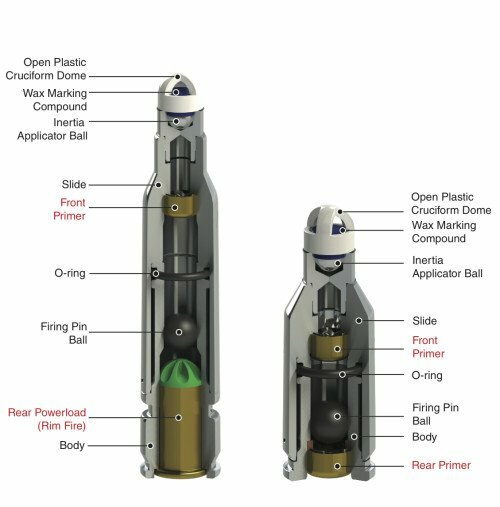 UTM RBT’s Cartridge Systems are the first to isolate the large amount of operational energy needed to cycle the weapon from the small amount of energy required for propelling the UTM RBT projectile. The isolated primers allow for total control of the cartridge energies, providing the consistent velocities necessary for improved accuracy and controlled impact. Open plastic crucifix projectile dome – improves trajectory, prevents barrel clogging. The UTM patented designs WILL NOT allow live ammunition to be fired through UTM parts. They will fit correctly in the firearm they are designed for, but will not allow UTM parts to fire live ammunition, and will not allow UTM ammunition to be fired through regular firearm parts. The UTM AR-15 bolt. The French blue marking is clearly visible from the ejection port. This assured safety feature is accomplished through a rimfire primer and cartridge design, instead of the centerfire designs of patrol rifles and handguns. So even if a live round was somehow chambered in a UTM barrel, the UTM firing pin would strike the rim of the live round and miss the live cartridge’s primer. In the same regard, if a UTM round were somehow chambered in a standard firearm, the firing pin would strike the center of the UTM cartridge base, missing the rim primer. 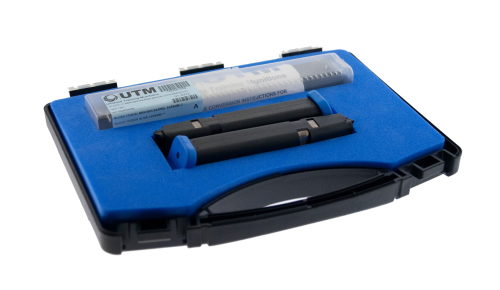 The Glock conversion kit with UTM slide and (2) French blue floor-capped UTM magazines. 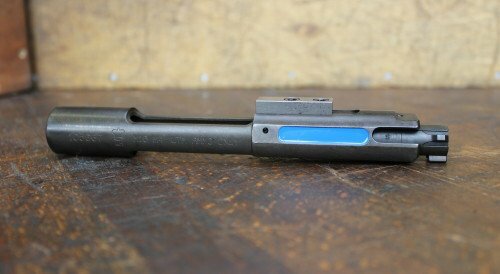 In addition, the UTM barrels and bolt carrier groups have a bright, French blue color marking to make positive visual identification easy for the user, safety officers, and other participants. The UTM magazines are the same bright, French blue, as well. The Glock slides are clearly marked, and the barrel modifications prevent live ammunition being fired. A UTM converted Glock pistol, with UTM RBT rounds in foreground. The ingenious concept of UTM Reality Based Training (RBT) Kits, as opposed to the commonly used counterparts (Simunition FX, Airsoft, etc. ), comes from the patented UTM pistol slides and/or bolt carrier groups and magazines. Instead of transitioning to entirely different weapons for force-on-force training, the officer simply breaks down their personal firearm and switches to the UTM components. The officer can then use UTM magazines loaded with UTM rounds, and they are ready for realistic training with the same firearms they use on the road. Using an officer’s actual firearm for Reality Based Training (RBT) is a very positive feature of UTM. 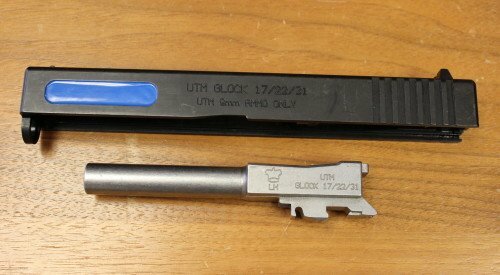 Originally the UTM RBT conversions simply had a pistol barrel change-out, or thebolt carrier group AR-15 switch-out. However, the most current conversion kits include a complete pistol slide with UTM firing pin, recoil spring, and barrel. This ensures that an accidental switch over does not occur, that might allow for a live round to be fired during training. The benefit of this arrangement cannot be understated. Like many of today’s law enforcement officers I have trained extensively with Simunition FX or Airsoft rounds. In some training environments they even let the bad guys use paintballs – not fair at all! However, each of those other options requires officers to use a different weapon than the ones they will use on patrol, no matter how similar they may be. The Airsoft guns do not weigh, or function like a real duty firearm, and often fail to perform because of weaknesses inherent in the soft pellets and the constantly depleting gas pressure needed to function properly. 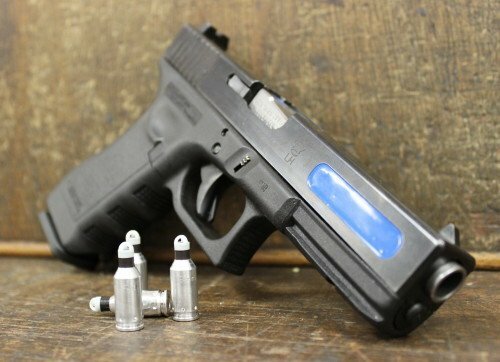 Even Simunition Glocks are a little different, because they have standard sights and not the Trijicon sights we use. And who hasn’t had a Simunition gun fail because of jammed rounds in the barrel! 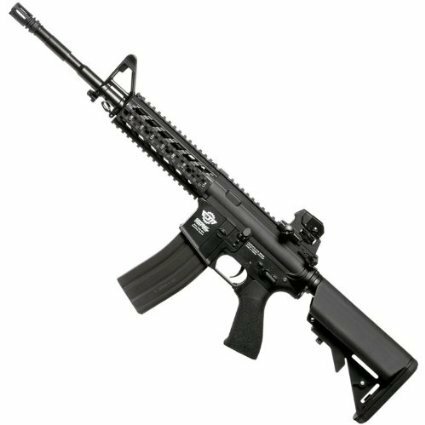 A G&G airsoft AR-15, made from metal, advertised on Amazon.com. The UTM rounds fired very well through actual firearms that had been converted for UTM use. If I remember correctly we did have one malfunction on the pistol. After a magazine change, and we had no further problems. We were able to fire around 50 total rounds, between rifle and pistol. Despite the small number of training rounds fired, I was very impressed by what we observed. Though the AR-15 had a red dot sight that was zeroed in for the 15-yard range (UTM rented a small room), the rounds were easily put right on top of each other. Once I figured the Point of Impact (POI), which was slightly off of Point of Aim (POA), I put all of my rounds into about a quarter-sized grouping. On the Glock I was able to keep a grouping of around 3″ at 12 yards. UTM RBT 9mm MMR 6.9 grains 335 fps 1.4 ft./lbs. UTM RBT 5.56mm MMR 6.9 grains 375 fps 2.1 ft./lbs. Simunition FX 9mm 7.0 grains 360-490 fps 2.2 - 4.1 ft./lbs. Simunition FX 5.56mm 3.5 grains 650 fps 3.7 ft./lbs. Paint Ball 49.0 grains 300 fps 9.8 ft./lbs. 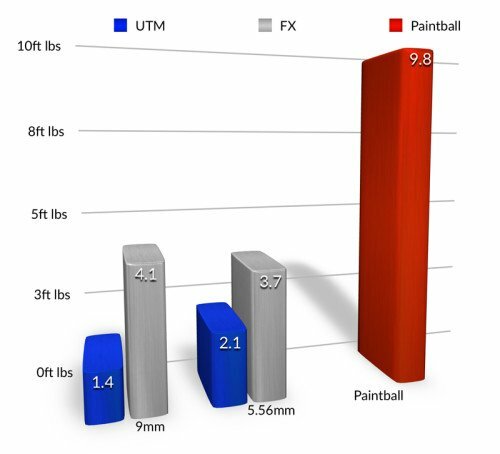 Like Simunition weapons, and to a lesser degree Airsoft weapons, the UTM conversions provide the user with recoil. Expended cases are ejected like live ammunition, and the system is designed to create slide or bolt lock-back when the last round is fired. 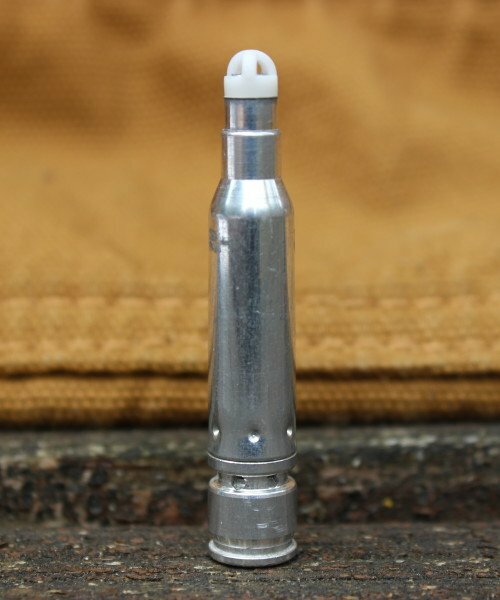 Unlike Simunitions FX rounds, the UTM round’s very unique design prevents barrel clogging, providing users a more confident and productive training experience. The marking element of the projectile is surrounded by a heavier plastic cruciform dome cover, rather than the thinner coverings of Simunitions FX rounds. Originally, the UTM RBT rounds were thin aluminum domes designed to flatten and spread the wax marking compound upon impact. With a greatly reduced velocity the projectiles did not present a serious injury potential, but many consumers were not confident in a metal projectile design. A close-up of the UTM 5.56mm RBT round, and their patented crucifix dome. The new design incorporates much of the original design, which is really a very complex system. As you can see from the diagram below, the UTM rounds are not just a paint marker and a reduced powder cartridge. There is a lot of science and innovative designs in these bad boys. The rimfire primer is a key safety feature, unlike Simunition FX rounds. As the round is fired, the pressure from the Rear Powerload (a necked down .22 caliber casing) thrusts the firing pin ball forward, striking and firing the Front primer. That discharge forces the activation firing pin ball allow for and O-ring design, ensure that the projectiles will not only discharge properly, but have the consistent energy needed to maintain accurate flight. The UTM 5.56mm and 9mm RBT rounds are ingeniously designed. Having used both Simunition FX rounds and Airsoft pellets, I can’t tell you how many times I’ve had rounds go in crazy paths during flight. With Airsoft it has a lot to do with the lightweight pellet, and the amount of gas charge still left. The Simunition FX plastic projectile skins are much lighter and often get comprised during hand-loading, cycling, and firing, causing wax barrel and chamber obstructions that interfere with velocity, accuracy, and ultimately function. The UTM rounds have a reduced velocity than even Simunition FX rounds. Their more aerodynamic design maintains accuracy while reducing the risk of injury. Anyone who has been hit by Simunition FX rounds knows the welts, scrapes and bruising that comes along with those hits. 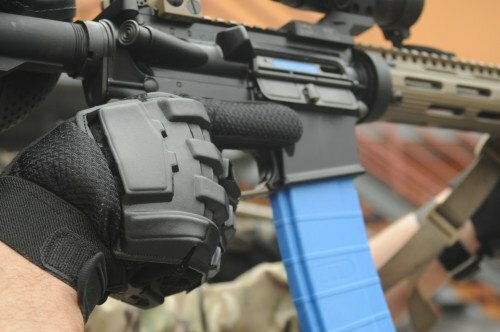 The UTM rounds will still have a pain penalty, but their potential for welts, scrapes and bruising is reduced. 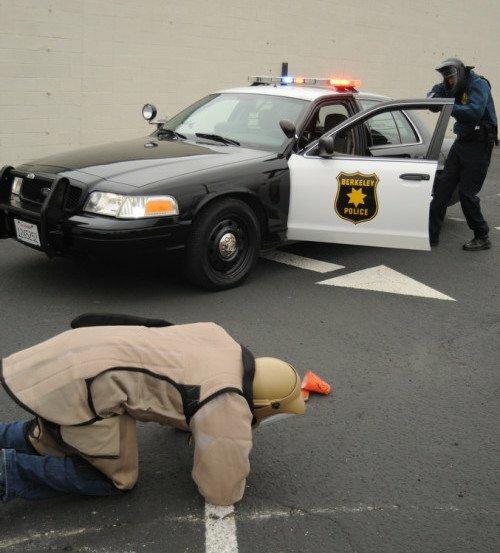 Granted, a part of “reality based training” is for officers to suffer a pain stimulus when tactical errors are made. However, going away from a training session with injuries that take several days to heal is not a desirable side effect, and can be counter-productive to adult learning. UTM has conversion kits for the most popular law enforcement handguns being used in America today. Smith & Wesson – 5906, 5943, 5946, M&P 9mm, M&P .40 cal. Walter – P5, P99Q, PPQ. 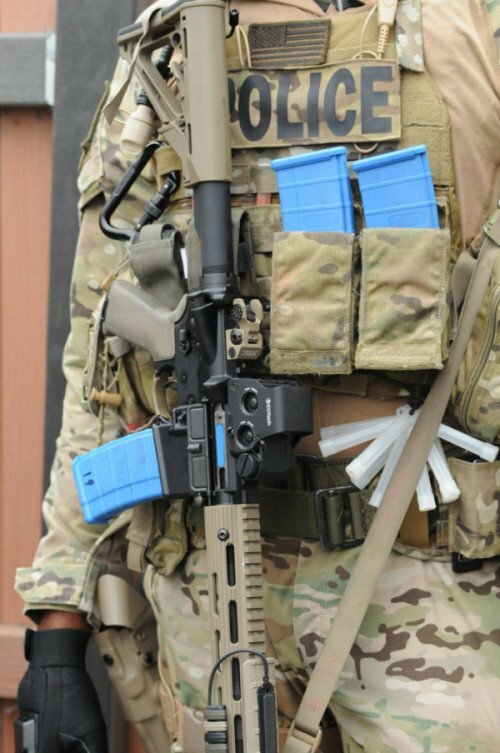 Though not has many conversion kits as their handgun conversions, the UTM rifle kits still cover the fast majority of American law enforcement patrol rifles. For those still using a sub-machine gun style platform, UTM has the most popular SMG’s covered as well. H&K – MP5, MP5K, UMP. There are also fully dedicated AK-47 and MP-7 UTM weapons, along with conversions kits for several revolvers, and shotguns. UTM was founded in the United Kingdom in 2000 with a mission to provide a safe training ammunition that would allow military, law enforcement and professional training organizations to ‘train as they fight’. The original zinc round was introduced to the market with such success that UTM was sold in 2003 to its current owners, JEB Engineering Design Ltd (to then form the UTM World Holdings Group), a precision engineering and high volume manufacturing firm. Continued success led UTM to seek out a training company with the same innovation, experience and pioneering spirit as UTM. In 2010, UTM found those characteristics in Phoenix RBT (Reality-Based Training) Solutions, LLC, started by two former Federal Law Enforcement agents that recognized the failings of previous law enforcement reality training. Together they formed a strategic alliance to bring a holistic, immersive approach to training – made possible through UTM technology. UTM is more well-known than you may imagine. The new design, quality control, craftsmanship and engineering advancements proved more than successful when it was tested by the US military and achieved a 99.8% reliability and safety rating in 2007 and every year since. That makes UTM training munitions the highest rated non-lethal training ammunition on the market, with the added benefit of being fully U.S. EPA approved land fill safe, low emission, and with non-toxic primers available. Those research findings, along with extensive testing by elements of the U.S. Armed Forces, resulted in a major US Department of Defense contract for their Close Combat Mission Capability Kit (CCMCK).